Even though the Winnipeg Jets’ 2018 Stanley Cup Playoff run didn’t end the way long-suffering ‘Peggers wanted, it was nonetheless filled with memorable moments. It was a near-magical 39 days that ushered the oft-forgotten into the national spotlight, brought seas of white to city streets, and boosted levels of civic pride to an all-time high. Dustin Byfuglien is a mountain of a man. He showed off his strength in Game 3 of the Western Conference Final on May 16 when he single-handedly extracted a pair of Golden Knights from a big scrum in front of Marc-Andre Fleury. Like a world-weary principal breaking up yet another fight, the 6-foot-5, 260-pound d-man plucked Tomas Nosek and Colin Miller out of the pile like they were light as feathers. It wasn’t the first time in the playoffs Big Buff outmuscled two men. Against the Nashville Predators a few weeks prior, he rag-dolled Austin Watson and Roman Josi — both big boys over 6-feet-tall — simultaneously. 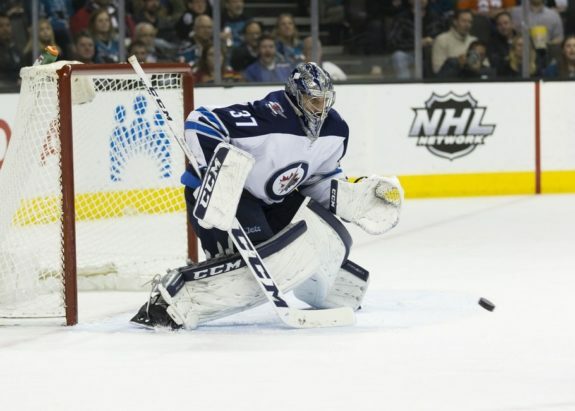 Connor Hellebuyck was a rock for the Jets all season long, and that trend continued into the playoffs. The 25-year-old backstop posted a goals against average of 2.36, save percentage of .922, and a pair of shutouts. He had a number of good starts this spring, but none of them came even close to the performance he turned in in Game 1 of the second round versus the Predators on Apr. 27. He stood on his head and managed to soak up the barrage of shots he faced from every conceivable angle. He made 47 saves — including 20 in the first period — and helped the Jets win a game they didn’t have any business even being in. If you want to enter series-clinching celebration mode early, score four goals before the game is 12 minutes old. That’s exactly what the Jets did in Game 5 of their first-round matchup with the Minnesota Wild on Apr. 20. Jacob Trouba’s goal just just 31-seconds in set the tone for a 5-0 beat down and the first playoff series win in Jets/Thrashers franchise history. It wasn’t dramatic, but it was exciting — the final 48 minutes of the game were simply academic as the Wild had less chance of coming back from 4-0 than one has of getting a cat to fetch their newspaper. Mark Scheifele made a lot of opposing teams’ fans very unhappy this spring, especially the rabid, mustard-clad fans in Bridgestone Arena. 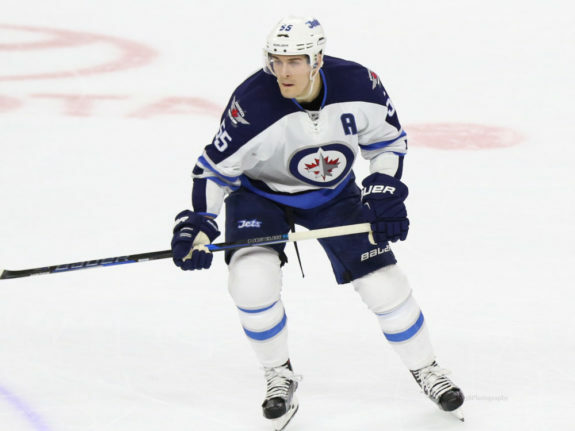 Scheifele had an outstanding playoffs, scoring 14 goals in 17 games and falling just six tallies shy of breaking Reggie Leach’s decades-old record for most goals in a single playoffs. He did, however, set a new record for most road goals in a single playoff series when he potted seven in the second round series against the Predators. He leapt over Marian Gaborik’s mark when he scored two goals in the Jets’ Game 7 victory on May 10. “There’s no place like the road” isn’t how the old song goes, but obviously Scheifele doesn’t care. Speaking of the Jets’ Game 7 victory in Nashville, there was no moment more exciting than when the team drubbed the league’s best and chased Pekka Rinne from the crease. The anticipation and tension were palpable as the Jets prepared for their first Game 7 in franchise history, the deciding game of a back-and-forth series that was dubbed a “Clash of Titans” and lived up to — if not exceeded — all the hype and hoopla that surrounded it. 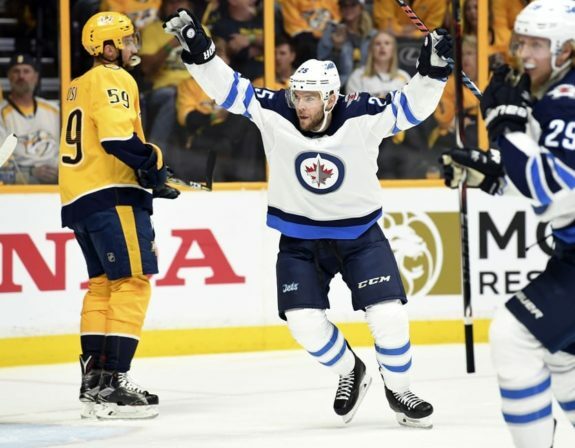 Unlike their Game 6, where the Jets gave up an early goal and were subsequently well-contained by the Predators’ neutral zone trap, the Jets came out flying and ensured Nashville would have to open up and start skating. Tyler Myers and Paul Stastny shocked the Predators with two quick goals that chased the Vezina-nominated Pekka Rinne from the blue paint and left him despondent, pouting in the hallway. The Jets played a complete game, never panicking or allowing the Predators back into the contest and they cruised to a well-deserved 5-1 win. To triumphantly hoist Lord Stanley’s mug at centre ice as the last team standing is the pinnacle moment of glory. The Jets fell seven wins short of that moment this year, but the last six weeks were still chock-full of performances that will live on in Jets’ history. The Jets’ window to win is now. They have the all the pieces to be as compelling a Cup contender as the other top-tier teams. Three years ago, The Hockey News declared the Jets the 2019 Stanley Cup champs. If you’re keeping track, that’s next year.